A home rental agreement is a written agreement between house owner and the tenant/s which specifies rights and responsibilities of each party involved. Rental Agreements are prepared and signed by all the involved parties whenever a house is being rented, and is important because it legally protects both tenant and land lord. Any and all specific requirements, be it monthly rent or permission to smoke or to have a pet, can be detailed in a home rental agreement. Different landlords have different requirements and as per you necessities you can now download a home rental, Residential Rental Agreements form best suited for you from a wide range of sample we offer. They are available in word as well as pdf format. This is a simple agreement to rent out homes or rooms. It contains details regarding the names of the occupants and the accommodation provider along with the address of the landlord and also the terms and conditions under which the accommodation has been agreed to be provided such as payment of respective bills etc. 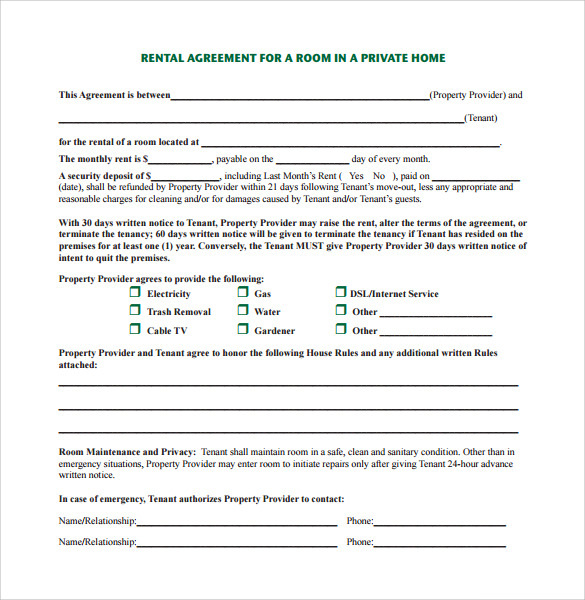 This is a written agreement template in statement form, which upholds the agreement of the Home-provider and the Renter to rent a particular property. 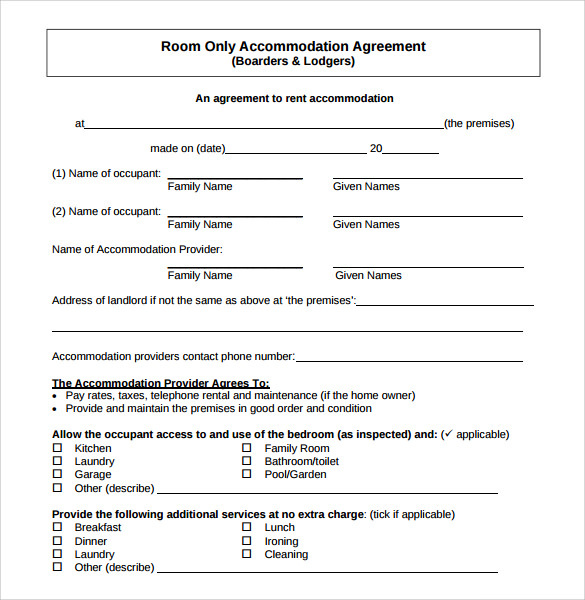 The details of the property is also mentioned in the agreement, such the furniture to be shared, restrictions such as smoking, drinking, alcohol, guests, term of agreement, etc. 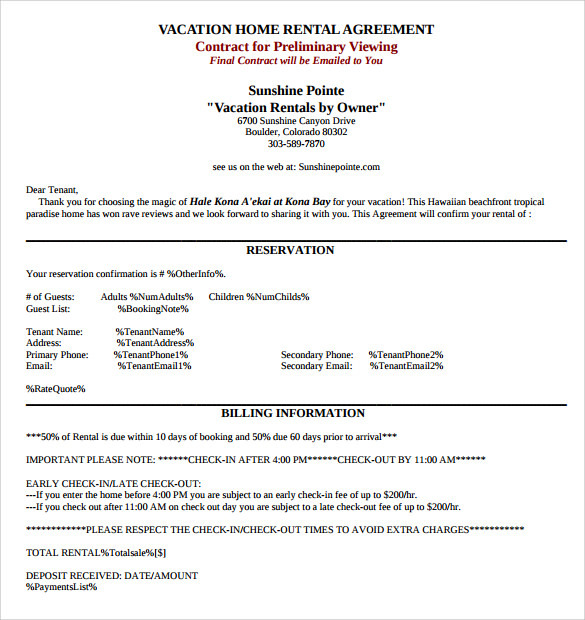 This is a home rental agreement for a short period usually for the purpose of a vacation. The provider draws up this agreement and mentions in it all the necessary details of the agreement, such as a small description of the property, names of the tenants, address, phone numbers, billing information, check-in and check-out timings, etc. A home rental agreement form is prepared by the home provider who is looking to rent out his property for a specified time period. In the agreement, he mentions details of the property, the terms and conditions of the agreement, the rate at which the property is to be rented and a lot of other relevant information. 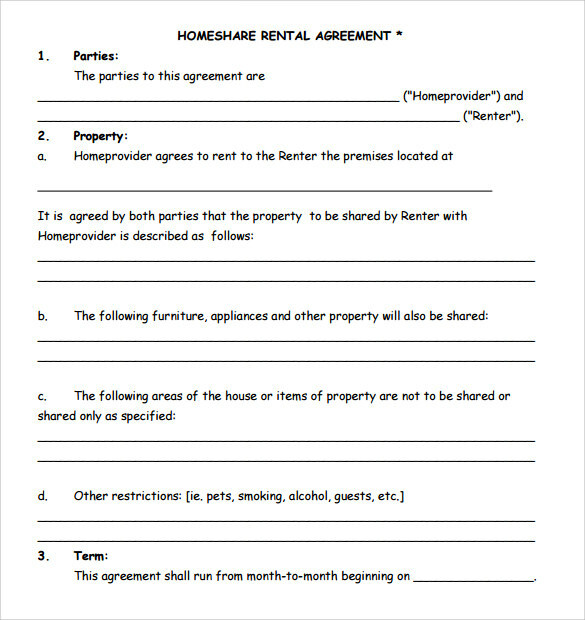 What is Home Rental Agreement Template? 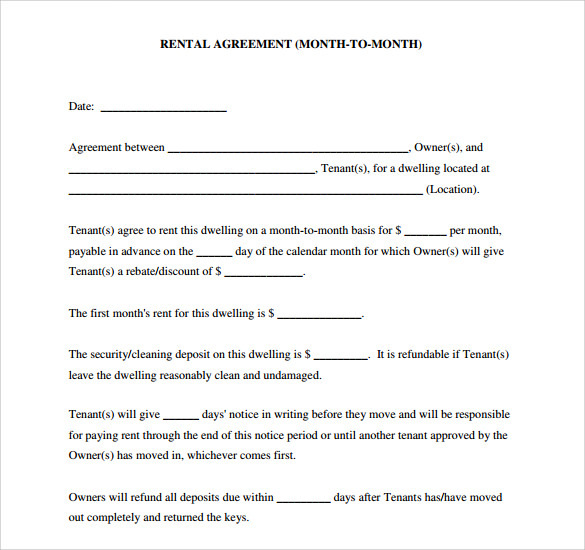 When do you Need Home Rental Agreement Templates? A rental agreement typically is an explicit, implied or written contract or agreement which is undertaken to disclose all the terms and conditions pertaining to the rental. Examples are leasing out real estate for housing, vehicle parking space, storage space, portions or whole of a property for business, government, institutional or agricultural usage, or other reasons. In the event of renting a real estate, the person who occupies the property is known as a tenant. How to Prepare Home Rental Agreement Templates? A rental agreement is very easy to prepare, but before that, you must have a property that is ready to be rented out and you must be willing to rent it out as well. With that said, rental agreements are not much difficult to prepare. You are simply required to put in the details of the person renting it and yourself along with the details of the property, date and time of the agreement and terms and conditions of the agreement such as specific details, rent details, period of lease etc. 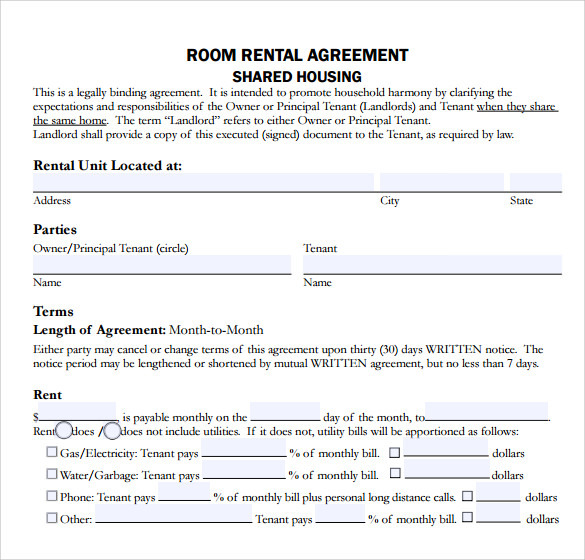 You can also see Apartment Rental Agreement Templates. Although very simple, preparing a rental agreement may sound like a bit of a hassle. You can easily do away with all of that and still get your job done. All you have to do is download one of these templates and you’re good to go.